So after explaining to you the history (and mystery) of the Margherita Pizza it’s time to show you how you can recreate this authentic Italian pizza in your own home. The Margherita pizza is classic pizza that always sells well in our Italian restaurant and the steps below will show you exactly how to make your own! Make the base: Put the flour into a large bowl,then stir in the yeast and salt.Make a well,pour in 200ml warm water and bring together with a wooden spoon or use your hands what we do in the Restaurant.When the dough is soft turn onto a lightly floured surface and knead for 5 mins until smooth.Cover with a tea towel and leave to rise. Make the sauce: Mix the plum tomatoes garlic,oregano salt and pepper together.Leave this to stand in room temperature. Roll out the dough: Give the dough a quick knead,then split it into two balls.On the floured surface,roll out the dough into large rounds about 25cm across, using a rolling pin.The dough needs to be thin as it will rise in the oven.Lift the pizza bases onto two floured baking sheets. Top and bake: Heat oven to 240C/Fan 220C/Gas8.Put another baking sheet or you can use a upturned baking tray in the top shelf of the oven.Smooth sauce over bases with the back of a spoon. Break up the buffalo cheese and scatter over the tomato sauce and season with oregano. Put the pizza still on its baking sheet on top of the preheated sheet or tray. Bake for 8-10 mins until crisp. 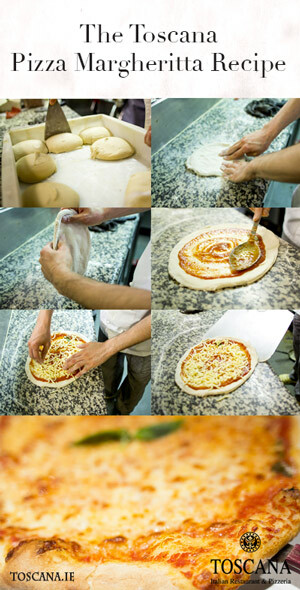 Repeat step for the second pizza and now you have made two Toscana Margharita pizzas. Magnifico !!! The Pizza Margherita from Toscana restaurant contains 4 Servings and shouldn’t take you too long to cook at all! If all goes to plan you should end up with a pizza that looks like the one in the image to the right. Serve it with a nice side salad and Sangiovese or Barbera wine and you’ll be enjoying the taste of Italy in your own home. Of course, if you’d prefer for us to cook the Margherita and leave the wine drinking to you, you can book a table here. Ciao for now..